Dr. Lacey Hays, founding member and director of DFW Brass, grew up on a farm in central Oklahoma and began playing the trumpet in 5th grade. Before beginning her Undergraduate studies, she was named an Emerson Scholar and attended Interlochen. Dr. Hays has enjoyed a career in numerous settings and has performed with orchestras throughout Europe as well as North, South and Central America. She has also given masterclasses and clinics throughout the US and South/Central America and has judged for The National Trumpet Competition. She performed at the first-ever International Trumpet Guild Regional Conference in Oklahoma City in 2018, as well as at the International Trumpet Guild Conference in San Antonio in 2018. Comfortable with numerous styles, Dr. Hays has performed with Johnny Mathis numerous times, has played for Broadway Tours such as An American in Paris, A Gentleman’s Guide to Love and Murder, Matilida and If/Then in Dallas, Carnegie Hall in New York, the Verdi Opera House in Italy and the Classical Music Festival in Austria. In addition to participating in several recording projects, Dr. Hays can be heard on multiple DVDs, including: The Legacy, a documentary featuring the Youth Orchestra of the Americas where she can be heard playing principal trumpet of Bartok’s “Concerto for Orchestra” under the baton of Gustavo Dudamel (Lobo Productions) and Messa Da Requiem with Placido Domingo conducting Verdi’s Requiem which was recorded and videoed in Munich, Germany (Glor Music Productions). Dr. Hays has also recorded for PIPE DREAMS, and Internationally Syndicated Broadcast. Currently Dr. Hays performs throughout DFW as a freelance artist, and often serves as a clinician and adjudicator, and has performed with the Blast of Brass Ensemble. 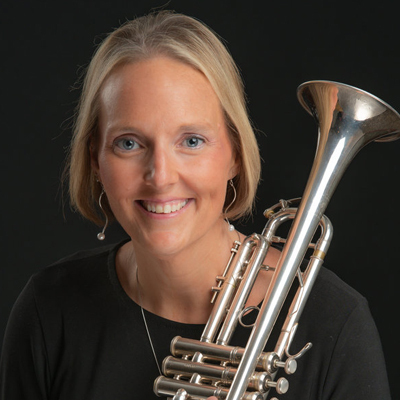 Enthusiastic about teaching, Dr. Hays is on the faculty of both Mountain View College and North Central Texas College where she teaches trumpet and lecture courses. She also teaches in the Lewisville Independent School District. She has served as faculty at the Oklahoma Arts Institute at Quartz Mountain and presented clinics and performances at the Oklahoma Band Master’s Association in Tulsa, OK as well as the Dallas Trumpet Workshop. She has also presented master classes at the University of Panama (Panama City, Panama), Bethel College (Kansas), Baylor University (Texas), University of Oklahoma, and Marshall University (West Virginia). Dr. Hays hold degrees from The School of Music at The University of Oklahoma (BM, BME, DMA) and The Shepherd School of Music at Rice University (MM). She is a member of Tau Beta Sigma, Pi Kappa Lambda, Gamma Beta Phi Academic Honor Society, Golden Key International Honor Society, National Society of Collegiate Scholars, International Trumpet Guild (for which she has authored articles), International Women’s Brass Conference, ASCAP, and Texas Music Educator’s Association. Her major teachers include Karl Sievers, Marie Speziale, Susan Clothier, and Mauro Maur.